It all starts with a plan… A marketing plan this time! One of the biggest benefits of developing a marketing strategy is that it helps you focus your resources and plan for business growth. The planning process helps you to understand the different factors that may affect your success. Instead of worrying about the future, you can actually have a sense of control over your business. In the diagram we are wanting to Illustrate all the possible tactics to consider when putting together a marketing strategy. Once we select which tactics, then we start narrowing down a plan of attack for our marketing strategy. We do help businesses with overall marketing strategies as well as single marketing tactic strategies. An example of a single marketing tactic strategy would be a social media marketing strategy only. Are you needing help with a marketing strategy? 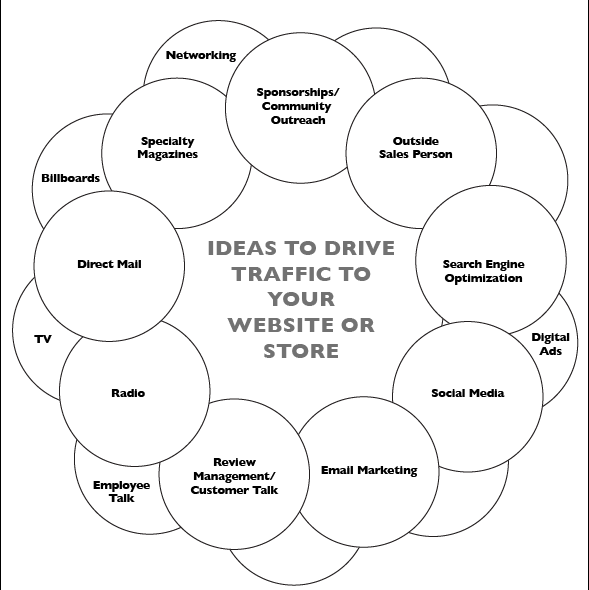 14 marketing tactics to consider when getting started with a strategy. The process of getting a marketing plan & implementing it. Step 1: MEETING OF Q&A – Getting to know the business I like to call it. Step 5: DEVELOP A STRUCTURE. A plan and a calendar is what it’s about! Step 6: DO THE WORK. The work has got to get done to be successful at this. Some marketing tactics we can do for you, some we can just guide you. Step 7: AUDIT THE WORK. Someone needs to check the work, make sure it is being done and then is the work being done working? Are there more sales in your business? Do you have more website traffic? We will analyze and report so we don’t keep doing things that don’t work!